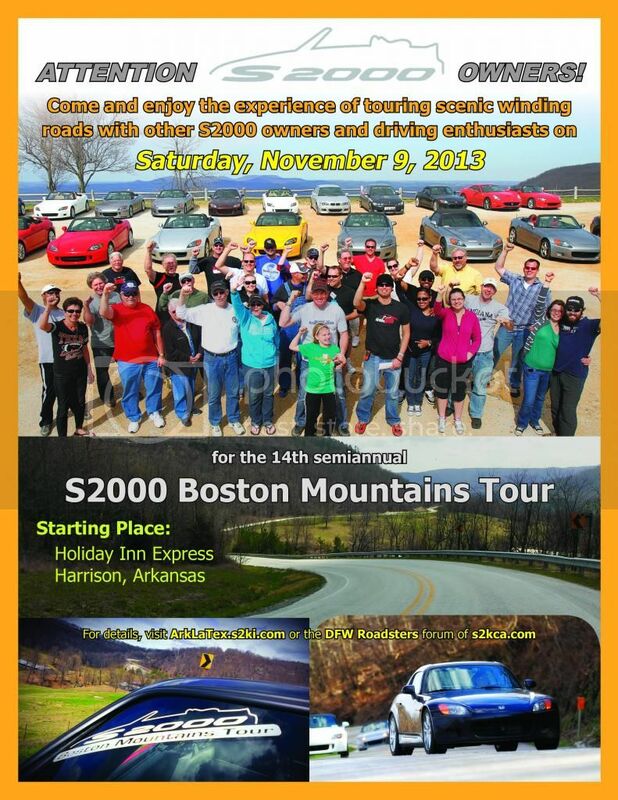 I am going to drive to Harrison, Arkansas to participate in Boston Mountain Tour (BMT). This is a great all day drive through the Ozark Mountains on Saturday, November 9th. I did this two years ago and the Fall colors and roads were wonderful. I will leave Thursday evening and drive half way to Dumas, AR. On Friday I will drive scenic Hwy 7 from Hot Springs to Harrison, AR. Only taking one day of vacation to have a super driving adventure. Some photos from Boston Mountain Tour. nice shots. Im going next year. Attached are two videos that capture the Bush Mountain Road which was our last stint of the day. Fast sweepers in 4th and 5th gear. Enjoy! Here is another video of the BMT Fall 2013. This is a morning drive before the mid-morning rest stop. Another video: Late Morning Run. Kind of interesting because we took some wrong turns; but, we all voted to do the Twistys Twice! I am working on the last video which captures the "Twistys" and another S2000 group fly by. Okay, this is the video that I am really excited to post because it shows the "Twistys". We did it twice and I am not sure that was an accident. Andy claimed to have missed a turn. No one was disappointed. 7:50 - S2000 flyby of another group. Note the "Gulf" Miata and exhaust. 10:24 - Turn around and do it again. 17:10 - Second run through the "Twistys". 23:32 - "Supercalifragilistic", "Do Again"
Enjoy the video. Thanks again to Andy for leading and the tailgunner for directional suggestions to Andy! I enjoyed yours and Michelle's commentary. The Spring Boston Mountains Tour 2014 will be held on Saturday, 12 April, in Eureka Springs, AR. Free Registration starts at 7:30AM at the Best Western Eureka Inn. Go to www.ArkLaTex.s2ki.com and click on Spring BMT 2014 thread to sign up. The all-day Tour starts and ends at the Inn in Eureka Springs, AR. Any great drives planned for the Fall?